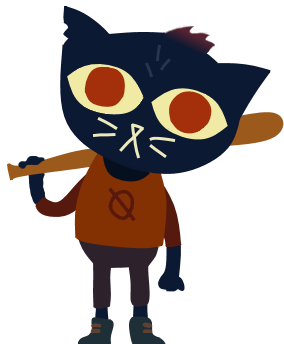 Mae Borowski is the cat-like main character of the 2017 adventure game Night in the Woods. She’s often snarky and sarcastic but acts compassionately towards her close friends. During a scene in which she attends a college party with her friend Bae, she meets and is immediately smitten by a woman named Bombshell, who she bonds with through an improvised secret handshake. One of the game’s writers, Scott Benson, has identified Mae as pansexual and Bombshell as a lesbian on his CuriousCat page. This entry was posted in 2010s, Characters, Games by Decade, Lesbian, Lesbian (explicit), Playable Character, Queer women on January 12, 2018 by Adrienne Shaw.